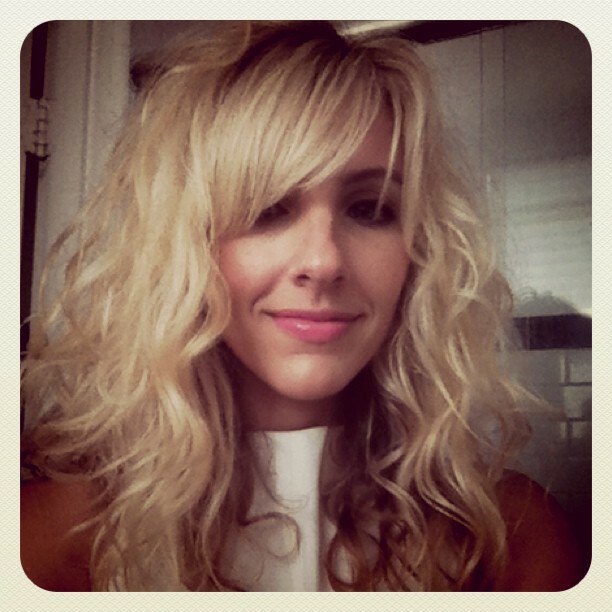 Embracing my big frizzy hair after seeing it all over the Spring 2012 runways. Feeling girlie in my Estee Lauder lipstick and Spike The Punch necklace. Admiring my new rain gear (J. Crew flats and Target umbrella). I'm prepped for fall. 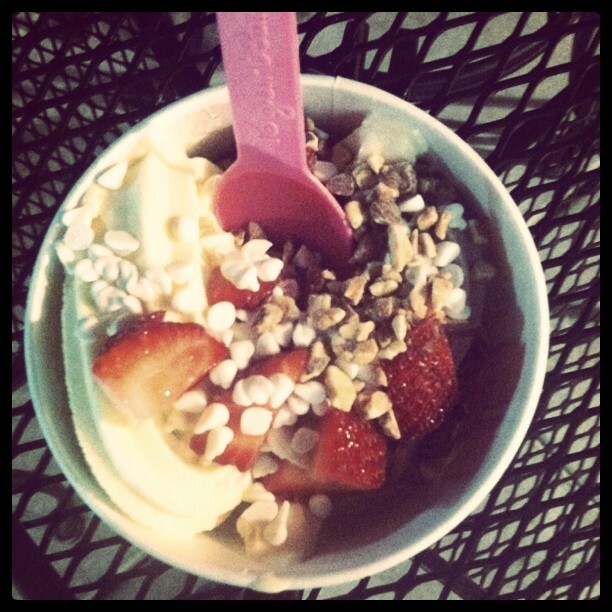 Devouring frozen yogurt (my favorite treat other than ice cream). 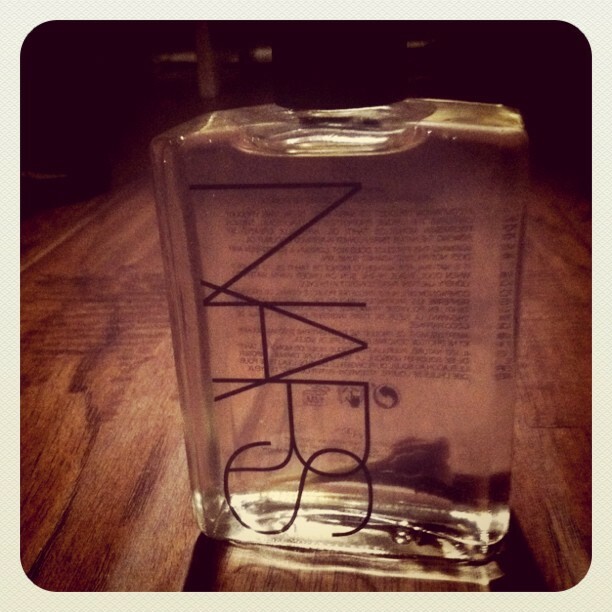 Lathering myself in my new Nars body oil (smells so fresh!). Standing over my mom's impromptu art project in her backyard. Wondering what to do with the massive amounts of jewelry I've acquired. For past snapshots head here, here, and here. Make sure to follow me on Instagram at Taylor Sterling and Glitter Guide to see more pics. Oh I love these, beautiful snapshots! Please join my first Giveaway!!!!! I can take all that jewelry off your hands for you haha. Thanks for always being inspirational + congratulations on Glitter Guide. It was immediately bookmarked on my browser bar. Great photos. And I love the Spike The Punch necklace, I have it in mint and mushroom. LOVE you hair like that! I have exactly the same feeling with my jewellery, i've just had a huge clear out of it! 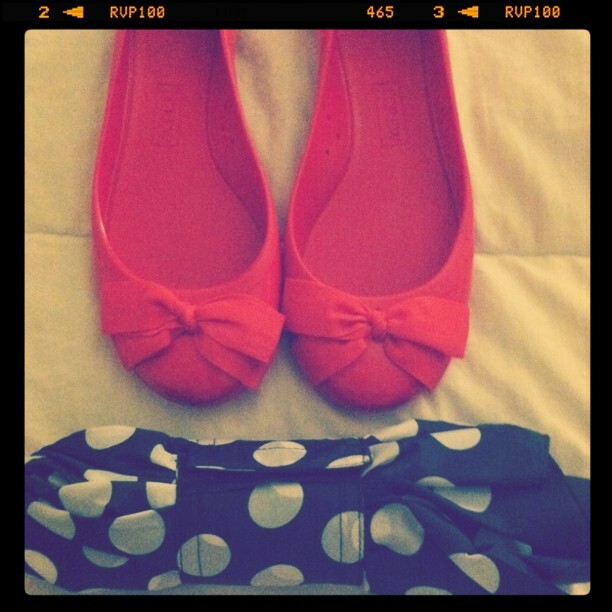 Love these snaps:) Cute red shoes and awesome accessories!!! You have a remarkable accessory collection, especially adore the Spike the Punch necklace! i love this necklace in the second photo! amazing pics! wow that's a lot of jewelry! love it all though! I'm so jealous of your gorgeous hair! Great photos! I love your hair. Would you do a "how to"? Even for those of us in our 50's, you have such a wonderful sense of style and always things that I can sneak into my "style"! Thanks. Love your hair! Those rain flats are so cute! That necklace is so cute. I might have to buy one. Oh wow! Your jewelry collection is amazing, bet you have amazing pieces! Oooh I totally need a necklace like your Spike the Punch one! great pictures, I love this green neon necklace!!!! Aren't J. Crew's rain flats the best? I have them in yellow -- so cute. These are some groove snapshots! I just adore the jewlery from Spike the Punch. I have one of their necklaces in lime green & purple. So pretty! I LOVE your hair like that! Wish mine did the same...I woud wear it nice and crazy-cool all the time if it did! All the jewelry is awesome! I love the Tom Binns look-a-like necklace!! Gosh I can never get enough to bits and pieces post hehe. Love he big hair! What fun snapshots. I love it!!! That umbrella is super cute and I could quite possibly live on frozen yogurt. Yum!!! Wondering what you think of my new outfit post with polka dots!?!! lovely snapshots my dear! your beachy waves are GORGE! 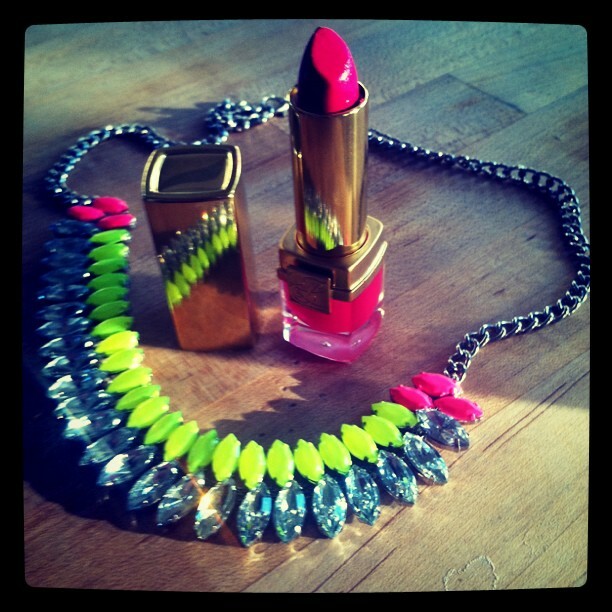 love the bright pink lipstick and colorful necklace! 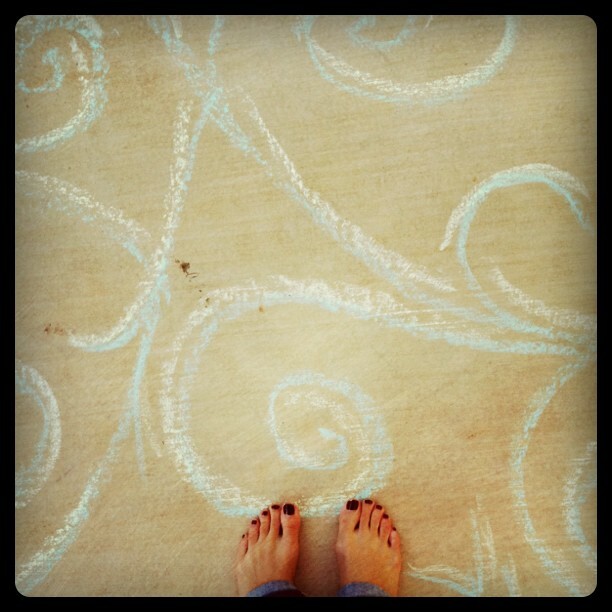 art projects are awesome....especially when they involve chalk! 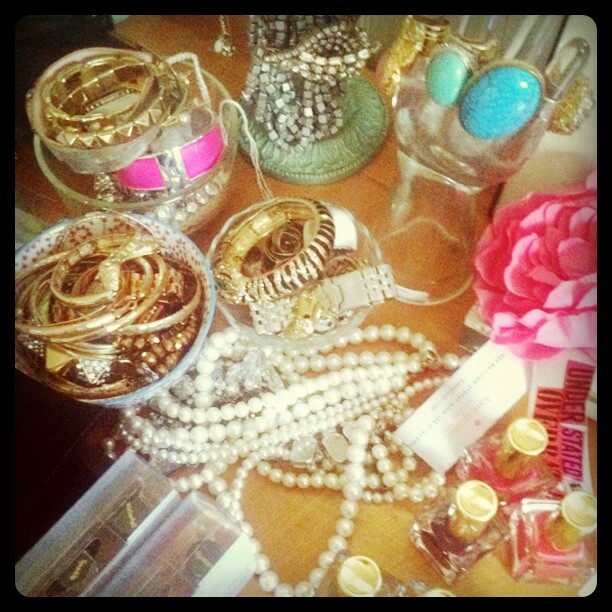 soo many fuun goodies...bangles, and pearls, and nail polish...oh my!! these snapshots are so beautiful!!! i LOVE that colorful necklace and that lipstick color is gorgeous!! Aww. So envious of everything. just bought two Spike the Punch necklaces - can't wait to get them in the mail!!! Your hair looks so beautiful natural. I wish my hair curled like that naturally. And man, your jewelry collection is insane. Can I have some?! Haha. Taylor, I love that you're embracing your curls/waves! I too am doing the same....quite nerve-wracking at first, but now I'm totally digging it and can't believe it's taken me so long to do this! Cheers! Just bought some of those spike the punch necklaces myself!